NYC, 05/11/2019, 1:00PM. Smallfoot (2018): Animation Brings Together Yetis And Humanbeings. 96 min. Directors: Karey Kirkpatrick, Jason Reisig. Starring Channing Tatum, James Corden, Zendaya, Danny DeVito. 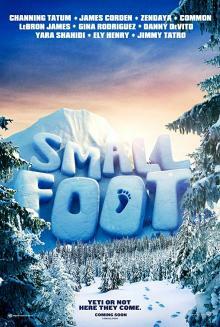 Smallfoot is based on the unpublished children’s book Yeti Tracks by Sergio Pablos. The movie has grossed $83.2 million in the United States and Canada, and $130.9 million in other territories, for a total worldwide gross of $214.1 million.